Boston is favored by 7 in a game with a 209.5 total. We start things off with a classic "good game, bad DFS game," which admittedly happens a lot during the playoffs. This game has the lowest total on the slate, and it also features two teams that don't typically bring the DFS value in the first place. Boston won the season series 3-1, but this series should be close enough that we certainly won't be worried about blowouts or anything like that. As of right now it looks like both teams will be featuring their full lineups, and while we don't need to worry about anything in the same way we did with Embiid yesterday, there isn't a lot of opportunity-based value jumping out at me right now either. Let's see what we can find, though. For a game with a low total, our lineup optimizer actually sees quite a loot that it likes on the Indiana side. A lot of this is based on somewhat aggressive projecting on our part, with the idea being that Indiana is a team should be primed to shortening its rotation come playoff time. There wasn't a single Pacer that averaged more than 32 minutes a game during the regular season, with things on the line late in the season we saw that they plan to play their two bigs here 34+ minutes in close games. Thad is criminally priced based on his late season production, and you can make a strong argument that the Pacers will be leaning more heavily on Turner as well. Both of these guys are great cash game options at rather thin positions today. After Thad and Myles, things get a little dicier. I'd like to think Darren Collison and Wes Matthews are in line for mid-30s minutes rotations this series, but it's a little hard to count on that given their late season injury woes. Bojan Bogdanovic falls in the "solid but unspectacular" category. On the Boston side things look a little sketchier, but there's still some value here from where I'm sitting. We've seen Kyrie step up his game in the playoffs in the past, and like Indy Boston is one of the teams that looks most poised to give their starters extra minutes come playoff time. Kyrie should make minced meat of the Pacers hobbled backcourt defense, and I love him as a cash game play here. Horford could be a sneaky big upside play if you think he goes up to 35+ minutes for the playoffs as well. The only other Celtic I like personally is Jayson Tatum, though our system seems value in Marcus Morris and Jaylen Brown, but I'd consider them riskier value options rather than high floor ones. Portland is favored by 3 in a game with a 225 total. Okay, I am pretty damned excited for this series for a number of reasons. The first is that I'm excited for good basketball. The second is that I'm pumped to be the Thunder here. I honestly can't puzzle out this line. OKC won all four of these team's match-ups during the regular season, they are healthier, and for my money they've got the best two players in the series in Westbrook and George. At the very least I expect this series to be a dog fight, though and quality hoops should abound. Whatever the Thunder's plans are here, we know what Westbrook plans to do: dominate the ball, and take matters into his own hands. Westbrook was up and down against the Trail Blazers in their four meetings this year, but given that the Blazers allowed the tenth most fantasy points per game to opposing point guards this year I can't sweat that small sample size too much. The fact is that Westbrook simply brings too much physicality for guys like Lillard or a banged up McCollum to handle, and you can believe he'll be maxing out his time of possession here. 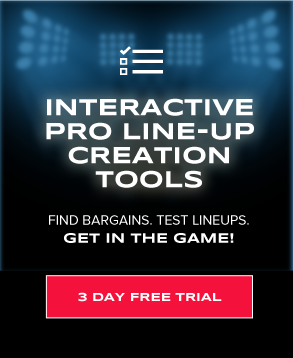 Easy pay-up option if you can find the cash, which looks comically easy on DraftKings at the very least. After Westbrook, our lineup optimizer wants to skip past Paul George and go to the mid-range value guys in Jerami Grant and Steven Adams. Center looks a little crowded, but power forward is wide open and if late season tells are any indicator we could see 40+ minutes per game from Grant this post-season. Pay close attention to Paul George's status. He's currently listed as questionable, and if he misses this one Dennis Schroder is the best player on the slate. The biggest question for DFS purposes in this series surrounds the health of CJ McCollum. If he's full healthy, he's $1,000 too cheap and should be in every lineup. If he's not as healthy as we think, and he plays the ~27 minute rotations he did in his two late season cameos, then Lillard should be in every lineup. My strategy here is going to be to just monitor Twitter, and if McCollum is available and not on a minutes limit he'll be in there for me. The only other Trail Blazer I'm enthusiastic about is Enes Kanter, but by now we've named four centers from four different teams. Kanter isn't my cash game play, but again, he has incredible upside since we know the Trail Blazers will run him 35+ minutes if he isn't getting punished defensively. I don't see Steven Adams doing that, so the upside seems profound here. Milwaukee is favored by 13 in a game with a 219.5 total. Today's version of the Golden State/LAC game. Man, this one could go in a number of directions, so let's break down the big picture before we dig into the specific plays. First things first, yes, this game features a Bucks team that is a 13 point favorite. 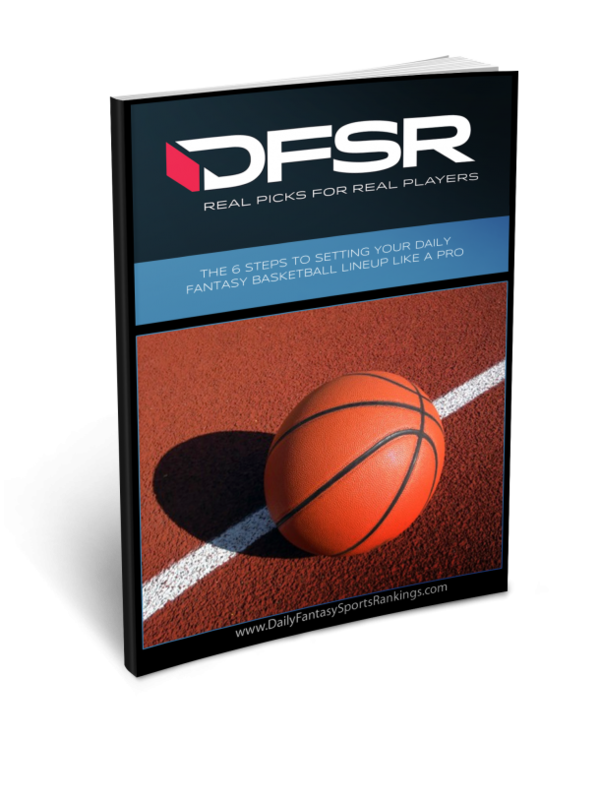 If you've played a lot of Bucks for DFS purposes this season you're well aware by now that they are happy to grab rest for their players at the earliest possible convenience. They gave their bench guys a lot of looks, and their starters should be well rested by now. That said, the Bucks are by far the DFS options that could benefit the most from shortened rotations. Giannis played less than 33 minutes per game this season. Middleton played just 31. Bledsoe was under 30! I just see no way that that's the plan as the playoffs proceed. That being said, it's just so hard to picture the Pistons hanging here (for a number of reasons), and I can't give any Bucks my unqualified recommendation here. On the Detroit side of things, it's even harder to get excited here. The one possible shoe that could drop is the potential absence of Blake Griffin, but as I felt with Embiid, I'm leaning toward us seeing him out there. The one thing that gives me pause is that they gave him a shot in must-win game against Memphis, and had to pull him after 18 minutes even though the Pistons were getting owned. He didn't suit up in a must-win against the Knicks, though that one was out of hand quickly. Blake's absence here opens up possibilities for guys like Thon Maker and makes Andre Drummond yet another interesting center option, but it's very hard to recommend any Pistons outside of straight up big tournament play. I actually think Ish Smith might be the most viable Piston today because he's such a big part of the come-back unit, but he's not without risk himself. Houston is favored by 6.5 in a game with a 214 total. These two teams were deadlocked during the regular season, winning two games each while blowing eachother out once apiece as well. I'm a little bit more bullish on the Jazz than a lot of people I see on the interwebz, as they are a classic un-flashy but super solid squad. They owned the 2nd best point differential in the West (after Golden State, obviously) and have a few players that could pose serious problems for the Rockets's D.
That said, do we really have that much value here for DFS purposes? The Jazz are all priced like Ricky Rubio and Derrick Favors are out, which was fine as the season closed, but not as fine now that they are both likely back for game 1. It's actually a killer for the Jazz guys' value across the board, and really only Donovan Mitchell and Rudy Gobert look playable among the starters to me. I think there's an interesting big tournament case for Royce O'Neale, though, even with Raul Neto likely back as well. On the Houston side, it's hard to be too excited about running their big guys into the meat grinder that is the Jazz defense. Harden just isn't the big money payoff you're looking for in this match-up, and while there's an interesting case to be made for Chris Paul if you think Houston pushes the envelope with high 30s minutes, it's hard to recommend him over someone you can be fairly certain of that happening for like Kyrie Irving. That said, these are some pretty interesting cheap filler options. Both Gordon and Tucker have had stints where they were playing high 30s minutes, and both of them play premium positions today. Now they're both obviously sort of bystanders to the Paul/Harden show, but given how tough the Jazz are inside you could see both relied upon for their outside shooting. I think both are acceptable cash game options here.